On 25 September 1608 Hans Lipperhey, an optician from Middelburg applied for a patent for a 'certain instrument to see far'. 400 years have passed since Hans Lipperhey, an optician from Middelburg, went to the States General in the Hague with a letter of recommendation from the States of Zealand, to apply for a patent for a “certain instrument to see far”. This letter of recommendation for Lipperhey’s patent application is the oldest document in the world which presents the telescope with certainty as an instrument for practical use — although the word ‘telescope’ did not exist at the time. Already in 1609 Galilei fixed an improved version of the telescope on the stars in the sky and saw what no-one had seen before him. Together with the microscope, which soon developed from the telescope, the instrument led to a spectacular shift in human knowledge, not only in science and technology, but also in the ideas about man an his place in Universe. Several activities were organized in 2008 to celebrate the 400th anniversary of the invention of the telescope. From its collections of manuscripts and books, Leiden University Library mounted an exhibition about the use of this instrument in astronomy and the prominent role of the Leiden Sterrewacht (Observatory) in international research (16 September – 12 October). In March 2010 an online version of this exhibition was made available: Van versiende bril tot radiotelescoop. 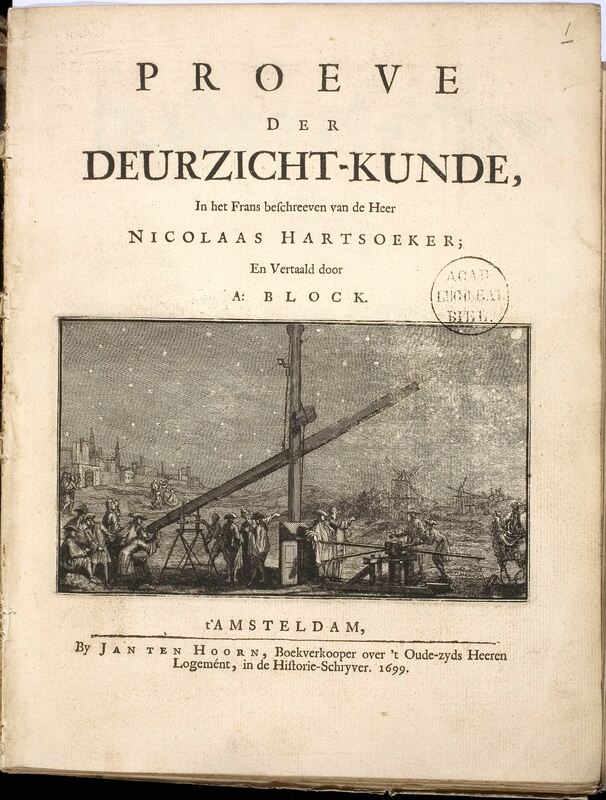 One of the exhibits is a publication by the Dutch scientist Nicolaas Hartsoeker. In his Essai de Dioptrique (Paris 1694) he described the lense polishing techniques he used to earn his living in the French capital. The title illustration of the Dutch translation, depicted below, shows the observatory Hartsoeker established in the 1690s in a bulwark near the Leiden Gate in Amsterdam.